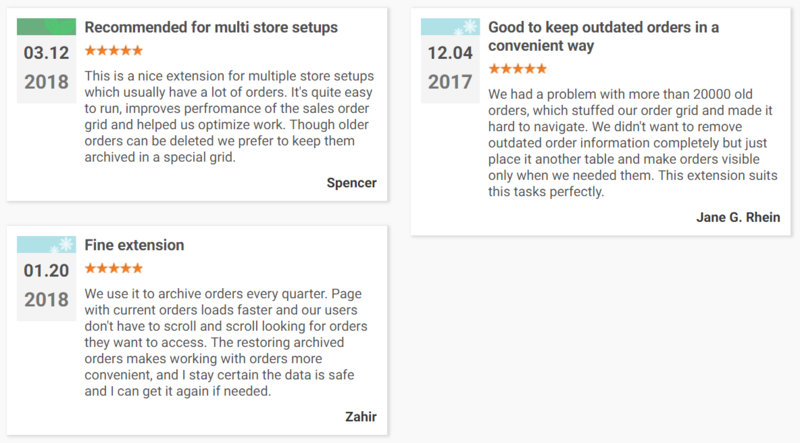 We’ve just described how to organize Magento 2 order grid most efficiently, and here is another solution for the same goal. The Amasty Order Archive Magento 2 module is developed to provide some lacking in Magento 2 features. First of all, the Magento 2 archive orders extension allows deleting existing orders. 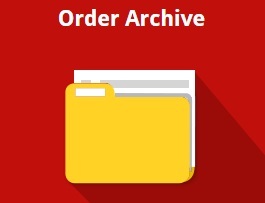 If you don’t want to delete them, it is possible to create an archive to which orders will be sent manually or automatically. Below, we describe core extension’s features, as well as shed light on the details of its backend functionality. 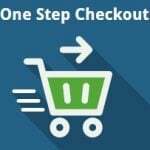 The Amasty Order Archive Magento 2 module provides two options that help to bring order processing to an entirely new level. As we’ve already mentioned, this Magento 2 extension allows you to delete orders permanently. 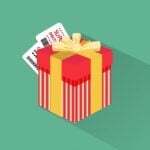 In addition to orders, you also remove all related data from your store. The action cannot be reversed, so you should always double check what you delete. Alternatively, you can make a backup before deleting orders. If something important is removed, the backup will always help you to restore the missing data. In case you don’t want to make any backups, just create a custom schedule for archiving orders. Thus, you will prevent your store from losing valuable information and at the same time keep the order grid clear. The second option provided by the Magento 2 archive orders module may be more suitable for most businesses since it is fully automated. There is no need to archive each order manually. You just create a schedule, and the Amasty Order Archive Magento 2 module does everything instead of you. There are 5 predefined types of archive frequency, and you can set the number of days before archiving orders. So, if you have a massive grid with orders for past several years, it is possible to archive all orders that are older than one year. 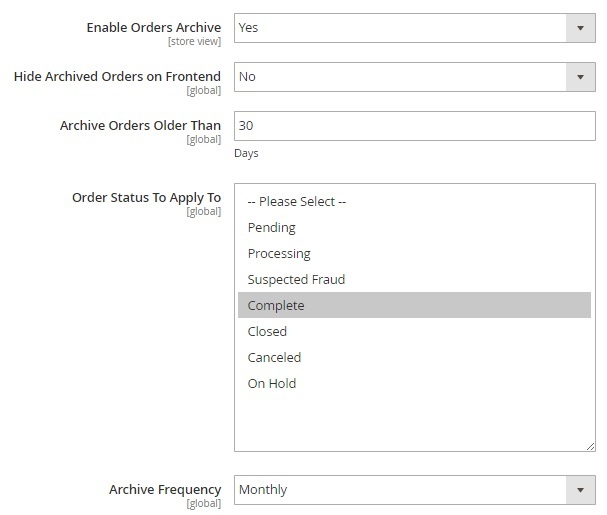 Furthermore, the Amasty Order Archive Magento 2 extension allows you to use order status as a filter for archiving. Although you can choose any status, we recommend you to archive complete orders. Note that it is always possible to archive orders manually by forcing cron job actions. Manual actions for specific orders. Go to Stores -> Settings -> Configuration -> Amasty Extensions -> Order Archive. There are three sections of settings here: General Settings, Email Notifications, and Force Cron Job Actions. In General Settings, enable the Magento 2 archive orders extension and activate the feature that hides archived orders on the frontend. Next, specify the age of orders to be archived and select order status to which to apply the function. As for the mentioned archive frequency, the Amasty Order Archive Magento 2 module allows running archiving on hourly, daily (once or twice), weekly, or monthly basis. In Email Notifications, you may decide whether to notify admins when archiving is complete or not. Next, type an email address for sending notifications and choose its template. In Force Cron Job Actions of the Magento 2 archive orders extension, you can start archiving orders manually by forcing the process. The archive is available under Sales -> Order Archives -> Orders. You can see the selected order here. Note that is is possible to move it back. Just tick the order and apply Remove From Archive command. The order will return to the grid under Sales -> Operations -> Orders. It is possible to delete orders from the archive grid permanently with the Magento 2 archive orders extension as well. Compatibility with Custom Order Attributes was introduced.